In 1701 (Genroku 4th), a feudal lord in later Hitachi-Kasama clan, Honjyo Inabanokami Munesuke received this land from the Bakufu and said to have constructed this garden. This garden is with a pond in the shape of the Japanese character “Kokoro” (heart) at its center location, using the system by which the water level in the pond fed from the Sumida River, rises and falls with the ebb flow of the river’s tide, what is called Sioiri-Chisen-Kaiyu-shiki-teien (garden with a pond carrying water from the Sumida River). In the era of Meiji Restoration, this has become a house of the load Ikeda Akimasa of late Bizen-Okayama clan, and then, in Meiji 24th (1891), it became the property of Yasuda Zenjiro, founder of the Yasuda financial group. After Zenjiro’s death, as specified in his will,, the garden and house were donated to Tokyo City in Taisho 11th (1922). However, in September of the next year, Taisho 12th (1923) the grounds were almost completely destroyed in the Great Kanto Earthquake. The City began re-construction work on the garden, using as a base “ishigumi” stone formations which fortunately remained and then it has been named after the donator of Yasuda to be “The Old Yasuda Garden”. In Sowa 2nd (1927), it was first opened to the public as the Japanese Style Garden, donated by the private charitable person. Taking the chance of its jurisdiction transfer from Tokyo Metropolitan Government to Sumida Ward in Showa 42nd (1967), it was fully re-constructed on a whole scale, and in Showa 46th (1971), it has been completely restored to the original condition of former times when it was called as a distinguished garden. 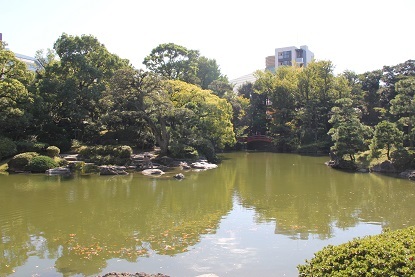 In Heisei 8th (1996), this garden was appointed to be the Noted Place of Tokyo as the typical garden of Meiji era. And as time passed, since its facilities have become quite old. Sumida ward made up a plan for Old Yasuda Garden Restoration & Management to leave such precious cultural properties for the future generation in Heisei 17th (2005). Based on this plan, we have been making effort to protect and keep such an important property of Old Yasuda Garden for further operation.